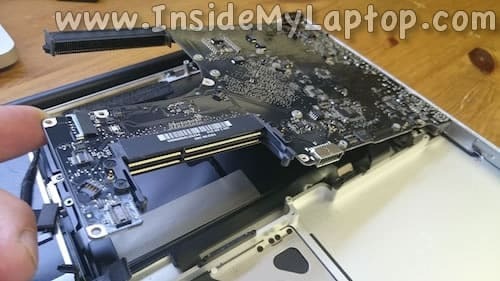 In this guide I explain how to replace thermal grease on a MacBook Pro. 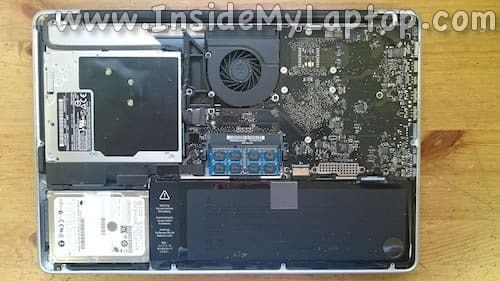 You can use the following instructions for 13″, 15″, 17″ unibody MBPs. When you remove the bottom cover you can access and clean up the cooling fan but the heat sink is mounted on the other side of the motherboard. In order to replace thermal grease the motherboard has to be removed. 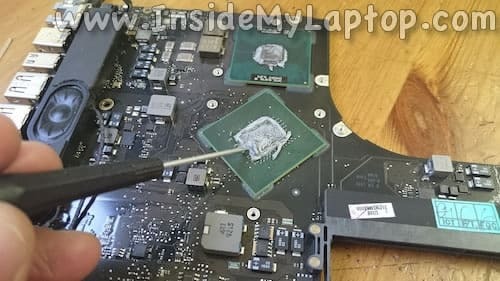 Follow instructions published on iFixit website to disassemble the laptop. Here’s how to find the correct disassembly guide. 1. Select the laptop series. 2. Select the screen size. 3. Select the model year. 4. Select the heat sink guide. 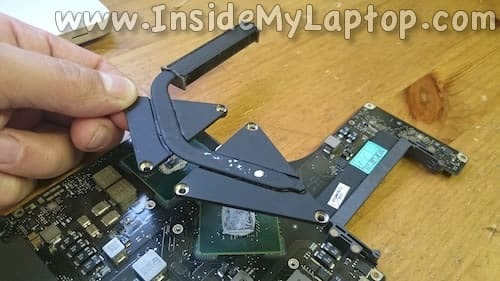 This set of instructions will explain how to separate the motherboard from the top cover. 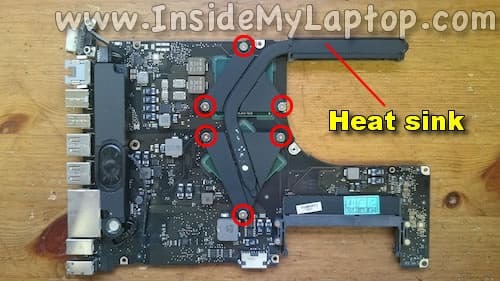 Earlier MacBook Pro models (2009-2010) have a single heat sink covering both the CPU and GPU chips (like in my example). 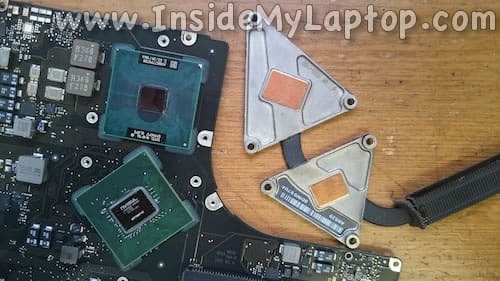 Newer models (2011-2012) have separated heat sinks or only one CPU heat sink. When the motherboard is out, turn it upside down and remove spring-loaded screws securing the heat sink. Slowly and carefully separate the heat sink from the CPU and GPU chips. 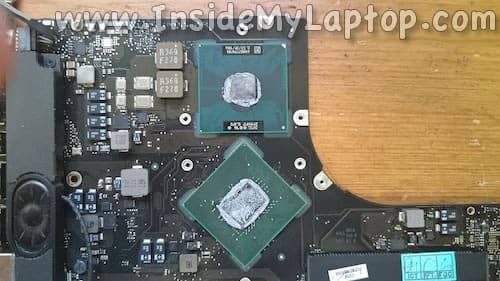 If thermal grease dried out, you might need to apply some reasonable force to remove the heat sink. Now you can access both chips. 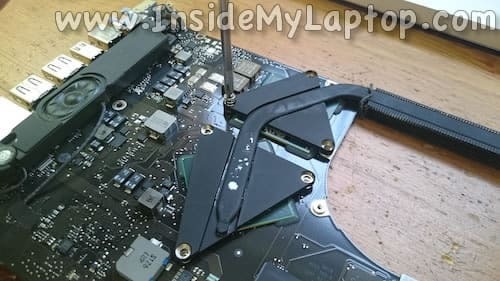 Remove big chunks of dried out thermal grease using a small flat heat screwdriver. 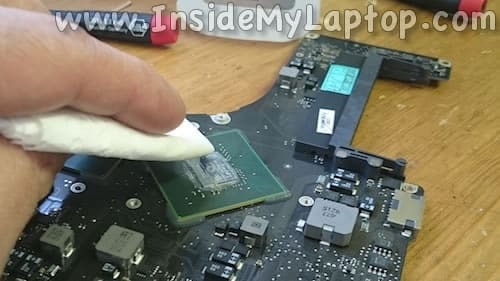 Clean up the CPU and GPU surfaces using a paper towel and 99% isopropyl alcohol. Do the same with the heat sink. When both chips and heat sink are clean, you are ready to apply new thermal grease. You can find new thermal grease on Amazon or eBay. You don’t need much. 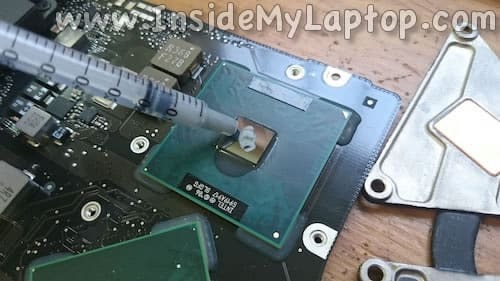 Apply just a small drop on the shiny surface of the CPU chip. It has to be just enough to cover the surface when the heat sink installed back in place. Do the same with the GPU chip. Finally, install the heat sink and secure it. Assemble the laptop following the disassembly instructions in reverse order. I have a HP Envy dv7with at screen 1600 x 900 and Nvidia Geforce GT 635M. Can I replace the LCD screen with a Full HD screen? Man… Thank you for all you do!!! I was nervous about tackling my HP pavilion laptop with a broken screen because last time I blindly followed instructions and broke its screen trying to fix the video cord. Without a manual available I just scrapped it as I couldn’t do what I wanted to do. Following your steps I felt confident and fixed my laptop that’s been broken for almost 2 years! I also actually ended up fixing 3 other laptops that have just been lying around due to lack of knowledge of the proper ways to do it! Thanks man! i want to know that what dureability of this ? Or should i sale my laptop? kindly give me propfitable consultancy.